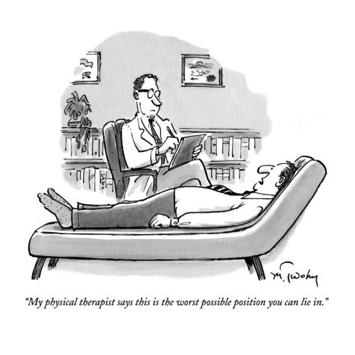 The “concern” – Do people really think this is what physical therapy provides? Or more concerning, is this the treatment people ARE receiving? If you are, I’ll be the first to say you need to find a new chiropractor, physiotherapist, osteopath, etc. The “frustration” – Without getting into my true feelings about Dr. Oz, I’ll attempt to be succinct. Dr. Oz has enough difficulty properly portraying physician practice and inferring physical therapy is passive modality-based treatment is erroneous, inaccurate and negligent. Although I wish I could just take Raspberry Ketones, put on Tiger Balm and lay on my Bumpy Ball for a healthy, fit, pain-free life. The “responsibility” – Chiropractors and Physical Therapists has been historically poor at educating the general public on our expertise and scope of practice and all frustration aside, I need to focus on what I can do as a professional and what we can do as a profession to improve this. Ultimately, we can not be overly frustrated with these poor stereotypes if we do nothing to reverse them. So, let’s start with the basics. Here are a few things I “am” as a Chiropractor / Physical Therapist. I am a Doctor – (4 year Bachelors degree) + (4 year Chiropractic Doctorate) = Doctor of Chiropractic. Here’s a crazy thought, from kindergarten to doctoral graduation I have spent 23 years of my 36 year life in school, ~64%. I am a musculoskeletal expert – A comprehensive study of healthcare providers found that physical therapist knowledge of the musculoskeletal system is second only to specialized orthopedic physicians. Just a thought next time you are divvy-ing up Trivial Pursuit teams or “phoning a friend” on Who Wants To Be a Millionaire. I am a movement specialist – Along with extensive knowledge of the musculoskeletal system, I specialize in the kinesiology of our body as a dynamic and biomechanically moving system functioning in synergy to perform everything from daily activities to elite athletic competition. Think Erector Set vs Legos. I am direct access – In the province of Ontario, you do not need a physician referral to see a chiropractor! And in all provinces, chiropractors are educated in differential diagnosis and can properly diagnose and direct you to the appropriate healthcare provider if it falls outside our scope of practice. I am cost-effective - Numerous studies show chiropractic is more effective and less expensive than medical care or surgery with results lasting longer. Studies also show care is less expensive when going to a chiropractor FIRST versus being referred from your physician. I am still learning – Continuing education is a constant focus and forms the foundation of my evidence-enhanced practice. Once a nerd, always a nerd. I am cutting edge – I utilize manual therapy, Low Level Laser Therapy, Graston Technique, Kinesio-Tape, Thompson Terminal Point Chiropractic Technique, and partner with RMT massage therapists, Osteopaths, and expert Pilates instructors. There is no therapeutic ultrasound machine, tiger balm or bumpy ball in my office. Identity crisis averted. For some of you this is common knowledge, but sadly for most of the general public these ‘basics’ are new to them. Here is my challenge to you. If you are a physical therapist, repost this or write your own informational post on Facebook, Twitter, website or blog. Social media is huge, embrace it. If you are someone who has had physical therapy or chiropractic and this isn’t new, then forward it to someone you have heard complaining of aches and pain who may not know. If this is new to YOU, then next time you have musculoskeletal pain (back pain, knee pain, shoulder pain, neck pain, etc)…see a chiropractor FIRST!